Whoever has one or two little girls at home, knows that the hair bows, clippies, necklaces etc. etc are laying everywhere. One good way to keep them in place is a clippie holder. In our home it works. When I take Tina's accessories off in the evening and put them on the sofa, she complains and tells me that they belong on the clippie and not on the sofa. Die deutsche Anleitung findet Ihr here. 1. Cut the pattern for the front and back out. Once out of the 5 mm felt and once out of the 2mm felt. 2. Transfer the pattern for the applique onto the paper side of the wonder under, iron it onto the cotton fabric and cut it out. then remove the paper backing and iron it onto the 5mm felt piece. 3. 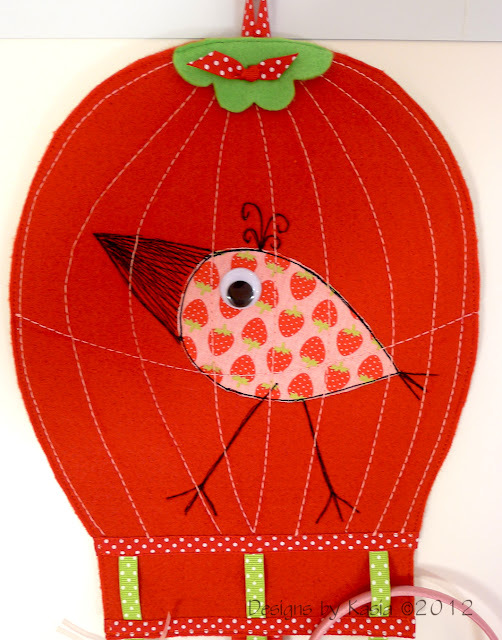 Transfer the details for the birdie applique and embroider it using the free motion technique. to do this, lower the feed dogs and install a quilting or a free motion sewing foot. Set the foot pressure lower than standard and the stitch length to 2. Play with the thread tension to get the results you want. I leave my thread tension on automatic and it works best for me. 4. Now transfer the lines for the bird cage and sew them with the thick thread size 30. Use a normal sewing foot for this. 5. Prepare your ribbons: cut each 50 and 20 cm of the 2 cm ribbon, 2 x 20 cm of the 1 cm ribbon and 4 x 10 cm of the 1 cm ribbon. sew the 20 cm lenght of the 2 and 1 cm ribbon on as shown in the picture and the patten. then fold 3 of the 10 cm pieces into loops and fixate them on the bottom of the cage. Then sew the last 20 cm long and 1 cm wide ribbon over it. 6. Fixate the 50 cm ribbon piece in the middle onto the left side of the front piece. Fold the last piece of the 10 cm thin ribbon into a loop and fixate it in the middle on the left side of the top of the cage. This will be the loop to hang the clippie holder. Fold the ribbons that you have sewn on before onto the left side of the front piece, place the back piece of the cage with the right side up over it and sew it on very close to the edge. 7. Install the felt flower using the brad and you are finished. You can also make another loop on the bottom of the long ribbon to put some more necklaces or hair bands in there. Attach the wiggly eye. have fun making your own and be sure to show and tell! Aber ich könnte so etwas für meine Scheren basteln- das wäre genial!!! Herzlichen Dank fürs Zeigen... totaaaal schön und super praktisch!! !